The world's first artificial liver has been grown from stem cells by British scientists. The resulting "mini-liver" is the size of a small coin; the same technique will be further developed to create a full-size liver. Unlike other efforts to grow liver cells, this new technique allows researchers to actually duplicate the structure of the organ. The mini-liver is useful as it is; within two years it can be used to test new drugs, reducing the number of animal experiments as well as providing results based on a human (rather than animal) liver. 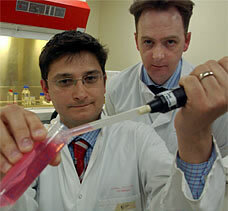 Researchers Dr. Colin McGucklin, Professor of Regenerative Medicine at Newcastle University, and Dr. Nico Forraz, Senior Research Associate and Clinical Sciences Business Manager at Newcastle University, say that pieces of artificial liver could be used to repair livers injured by injury, disease, alcohol abuse or other causes in the next five years. These artificial livers could also be used outside the body in a manner analogous to the dialysis process used to keep alive patients whose kidneys have failed. In fifteen years time, entire livers could be grown in the lab and then be transplanted into human beings. The stem cells used by Drs. McGucklin and Forraz in this research are gathered from umbilical cords ("cord blood"), seen by some as a more ethical alternative to stem cells created from human embryos. The cells are then placed in a Bioreactor, a device developed by NASA to simulate the weightless environment of space. 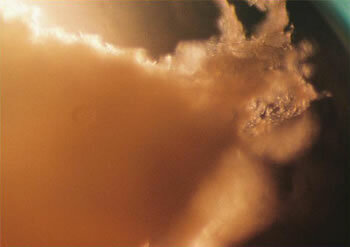 The cells are situated in a growth medium that is constantly rotated, putting the cells in an endless state of free-fall. Ordinary cell growth in a nutrient medium in a dish does not provide a culture environment that supports three-dimensional tissue assembly. Epithelial cells without a three-dimensional assembly environment lack the proper clues for growing into the variety of cells that make up a particular tissue. Epithelial cells are the basic cells that differentiate tissue into specific organ functions. In a rotating Bioreactor, scientists can fool cells into behaving as though they are in a body. The need for an additional source of livers for transplantation is acute. In the United States, more than 17,000 people are currently on liver transplantation lists, according to the United Network for Organ Sharing (UNOS). As the need for transplanted organs has grown more acute in our present-day world, the pressure to supply this need from condemned criminals has also grown, just as Niven predicted. Niven also coined the term "organlegging" to describe the practice of stealing another person's organs and selling them for transplantation. Scientists attached a unique bionic arm to an injured electrician's left shoulder - just like Steve Austin. Physicians have been studying specialized cells called satellite cells, which are the stem cells in muscles. Read an early article about liver tissue grown in a lab and Bioreactors. Thanks to reader Bob Fandrich for the tip on the story.